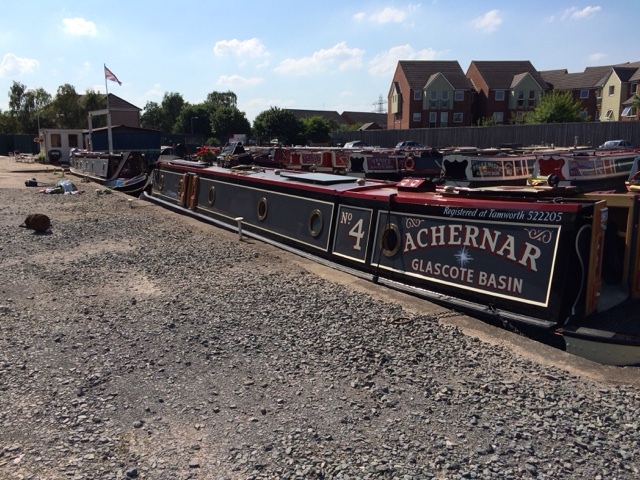 We have spent the past week at Achernar's home port of Glascote Basin in Tamworth. We were there for a Hudson owners gathering, which primarily took place over the weekend. By Friday lunchtime the basin was filling up nicely, and the small marquee which would house the beer had been erected. We ended up with 21 Hudsons present which represents about 10 percent of the total number built. On Saturday we were treated to a boat trip in Emu, a former working boat painted in the red and green. Later we had a barbecue which our hosts, Sarah and the Norton Canes staff also attended. It was good to see some familiar faces as some of the staff are former members of Hudson boatbuilders. Sunday started quieter, as people were slightly jaded from the consumption of the previous night, but ended with Chinese takeaway and more beer. Most owners departed on Monday, however we opted for one more night in the basin. Today we filled with water and diesel, took on a bottle of gas, and pumped out the waste tank. The entrance to the basin is on a slight angle to the canal, and for boats wishing to head north it is better to reverse out, fortunately the wind was light. 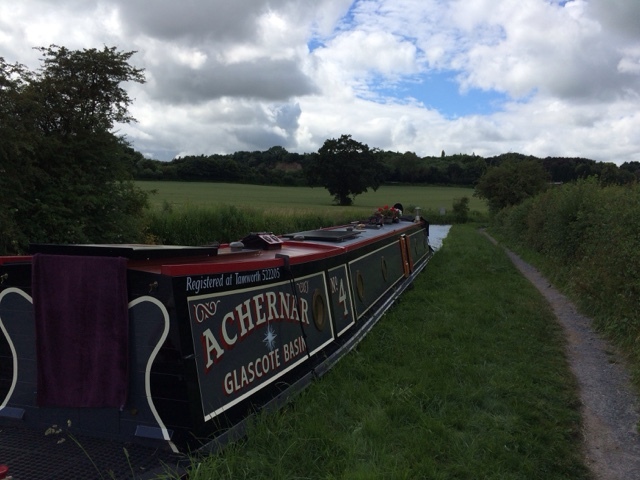 We descended the two Glascote locks fairly quickly and were soon on our way. We passed Fazeley Junction and the canal which leads towards Birmingham. Soon we were out of the built up area of Tamworth, and the canal began meandering through the countryside. 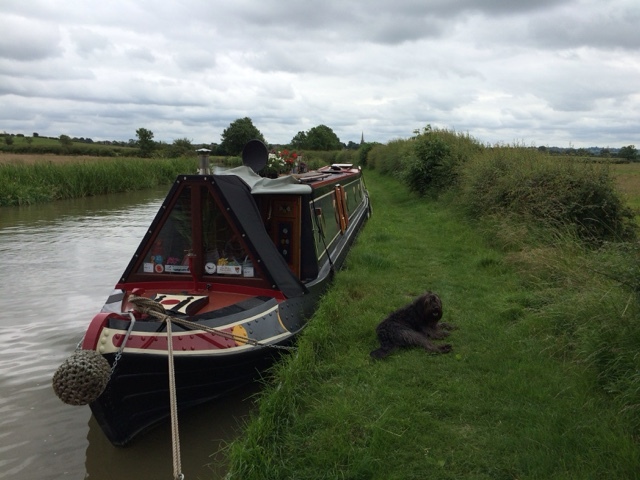 Once beyond the village of Whittington we found our mooring spot and settled down to lunch. We will stay here a while as the crew are planning to abandon ship again at the weekend. No blog was completed yesterday due to the extreme heat, which made doing anything other than drinking cold beer, unbearable. We had departed our mooring a mile outside Polesworth soon after breakfast. Nb. Neston had already moved off by the time we were up. We passed them again a mile further along the cut. As we were approaching Tamworth it was getting close to midday, and the heat was rising by the hour. Soon we were on the approach to Glascote Locks. The entrance to the basin is a sharp right turn beneath a bridge. We gave one long blast on the klaxon to announce our arrival and slipped into the dock. As we manoeuvred onto our mooring, we took extra special care not to bump the boat ahead of us. This was nb. 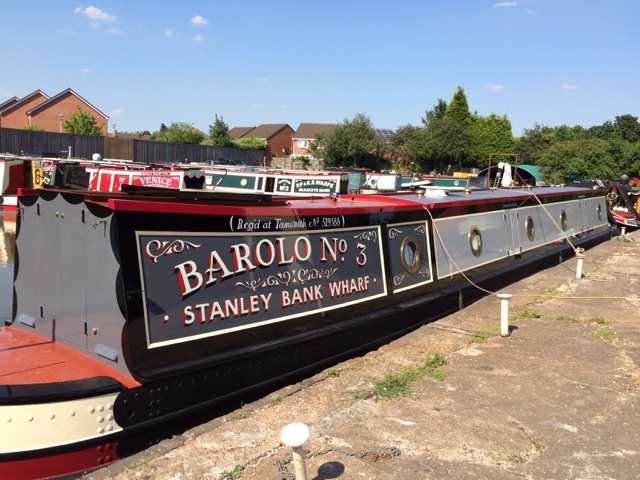 Barolo No.3 fresh from the paint shop, resplendent in her new colours. The basin has been taken over by Norton Canes Boatbuilders and is managed by Sarah who has kindly allowed this forthcoming gathering of Hudson boats to take place. Today, slightly cooler conditions allowed for the required washing and polishing. A check of the fenders followed, as drooping fenders is considered a crime at these events. Several more Hudsons arrived during the day including nb. Lydia May which is painted in the colours of Cadbury Bournville and is now breasted alongside us. The basin is starting to fill up with only another ten more boats to somehow shoehorn in. We will be here now whether we like it or not until Monday, as once the basin is full nothing is moving again until the end of the event. Whilst here I will perform a few engine maintenance tasks, well at least until the cold beer makes another appearance. Polesworth, Bridge 50 Coventry Canal. At 09.30 hrs we eased away from our mooring, for the short three minute journey to Springwood Haven Marina to use their services. For the past few days, whenever we have walked past the service pontoon it has been empty. Not today. As we rounded the bend we saw three boats already there, and another coming the other way, which we just beat into fourth position. Add to that the pump out machine was playing up, so we had a bit of a delay. Anyway, by 1130 hrs we were on our way towards Atherstone, and its flight of eleven locks. The top lock as is usual was manned by a lockeeper, but as we passed through we could see two further boats ahead descending the flight, with nothing coming the other way. All the locks would be set against us. We had planned to stop after five locks in one of the long pounds for lunch, but in the end decided to push on. Once down the flight it was only twenty minutes or so to our intended spot. It ticks all the boxes, rural, satellite and phone signal, wide grassy towpath, good views and today, sunny. This will be a good spot to wash and polish the boat and brass before it returns to its home port at Glascote Basin on Tuesday next week. Caldecote Hill, Bridge 27 Coventry Canal. 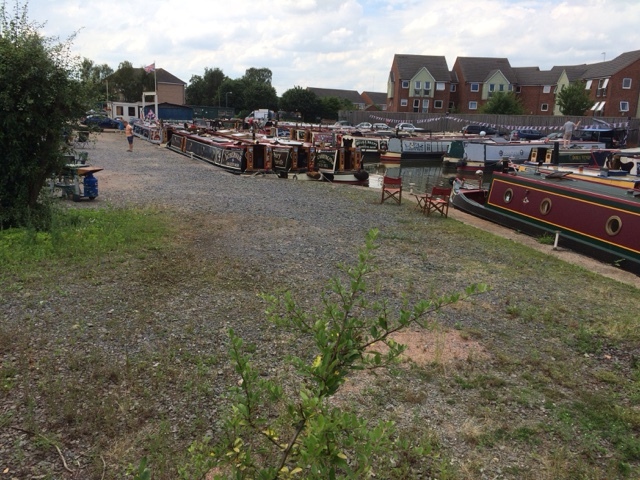 Having spent an enjoyable few days at Hawkesbury Junction it was time to move off. Just as we were preparing to depart, nb Neston passed us and moored a hundred yards ahead. I expect we will be playing leap frog with them for the next week, all the way to Glascote Basin. We stopped on the water point, just prior to the stop lock and filled with water. In the time we were there, four boats passed through the lock, which lowers you from the Oxford Canal onto the Coventry Canal, a drop of about 1 foot. We navigated through the junction, passing the Greyhound P.H. where we enjoyed Sunday lunch, and joined the Coventry Canal heading towards Nuneaton. The rain had been threatening for some time, and just as we approached Nuneaton, the clouds burst. For about ten minutes it felt like we were in a tropical storm, it was torrential. As quickly as the rain came, so it disappeared, and the sun came out. In no time, everything, including myself and the crew were dry again. Nuneaton seems to have cleaned up its act, as the canal was reasonably rubbish free, which was not the case on previous journeys. We passed through the town and head back into open countryside, arriving at our mooring spot just prior to Springwood Haven Marina. This is a nice rural spot and we were alone. We joked about how long it would last. It was twenty minutes. Still never mind, as we are staying put for a few days. After lunch we walked to the marina to check out the services, as we will need these when we depart on Thursday or Friday. Yesterday we departed All Oak Wood, along with numerous other boats who all appeared to be heading the same way, including the boat moored directly behind us, which turned out to be nb.Neston. This is a fellow Hudson boat, who are also heading for the boat owners gathering in Glascote Basin at the end of the month. 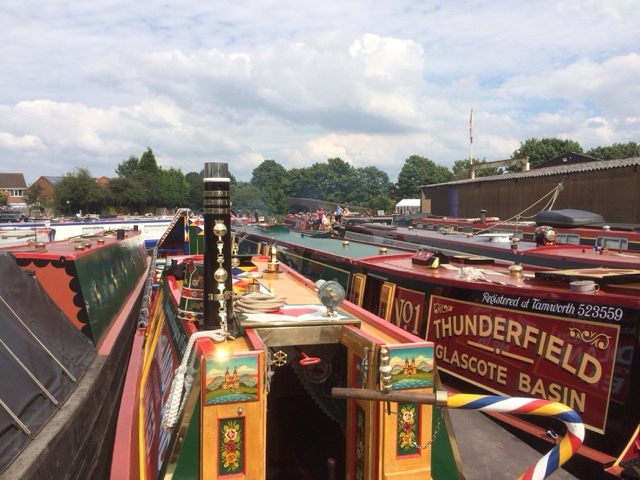 Once through the swinging footbridge bottleneck at Rose Narrowboats, we settled into cruising mode as part of a convoy of six boats heading north. Each boat spaced out at a distance of 200 to 300 yards. Passing through the village of Ansty, the convoy thinned out as some boats moored up, and others stopped at the water point. 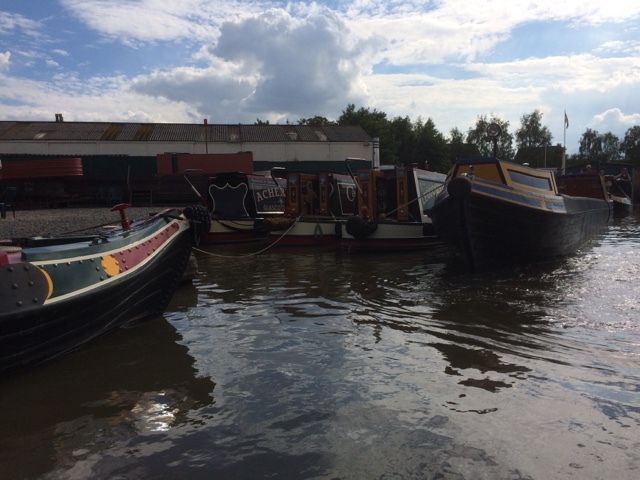 We pushed on breathing a sigh of relief as the moorings at Hawkesbury Junction can get quite full. So it was, as we rounded the final bend towards the junction we just managed to slip onto the final section of mooring, even here we have had to use pins rather than chains or rings. After securing the boat it was off to the Greyhound P.H. for lunch, and to book our Sunday roast as well. Just ahead of our mooring is where the Oxford Canal joins with the Coventry Canal. We have turned right here several times, but never left towards Coventry City Centre a mere five miles away. So today this is the way we walked. After a mile and a half we found some shops and topped up on groceries before returning to the boat. We will save going all the way into Coventry for another day. Yesterday was a long day for us. In fact, had we been running we would have completed a half marathon. 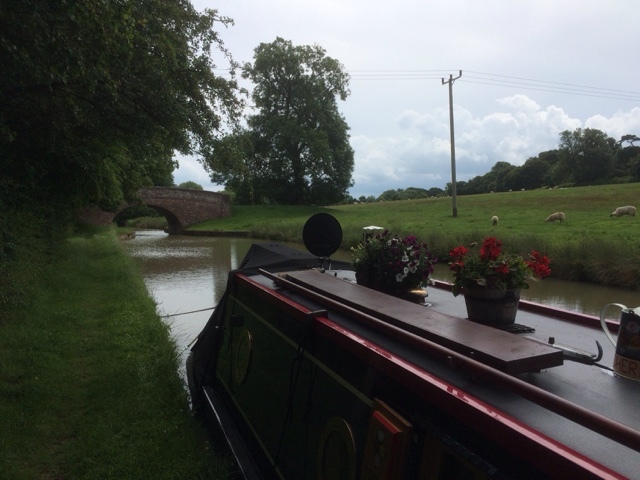 We departed our mooring near Braunston, not having had a very good nights sleep. It seems that something on our boat had attracted the attention of a large crow, who after partaking in the dawn chorus, decided to peck at the windows and the roof. The problem at this time of year, is the dawn chorus begins at around 4 am. Anyway, we set off initially for Hillmorton and the three locks located near to the old Rugby radio station. On route we passed our neighbours on nb Hereward, heading back towards Yelvertoft from their trip along the Ashby Canal. The locks at Hillmorton are in pairs, which usually means passage through them is quick, but not today. 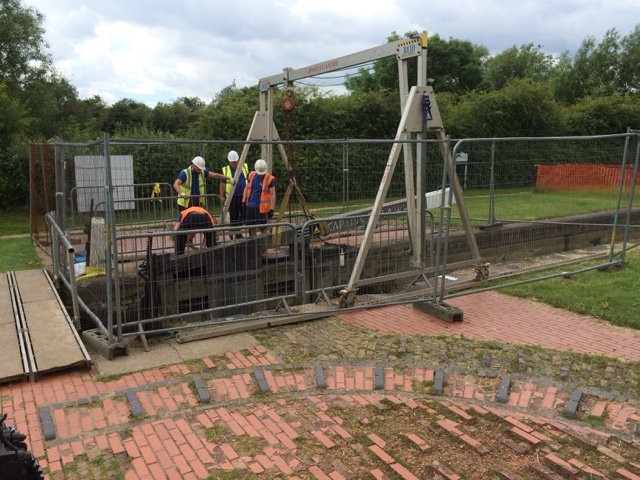 There is currently a stoppage on one of the middle locks meaning we had a slight delay. We did consider stopping for the day at this point, but instead pushed on for All Oak Wood a further six miles away. We passed through Rugby, and then the fairly short Newbold tunnel before rejoining the countryside. It was nearly 3pm when we arrived, and fortunately there were a couple of spaces still available in which to moor. Today, our rest day we walked both ways along the towpath from the mooring to explore our surrounds. Last year the bridge just along from the mooring underwent some major repairs. 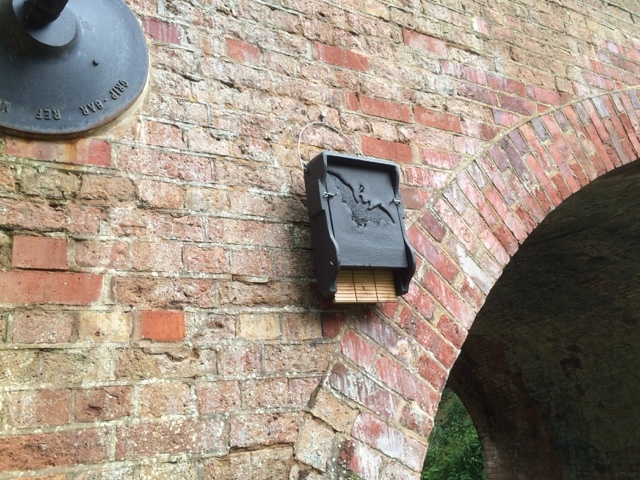 It appears that when finished consideration was given to supporting wildlife with the installation of bat boxes. Not too sure if it's occupied, though I may take a walk back at dusk to see if there is any activity. 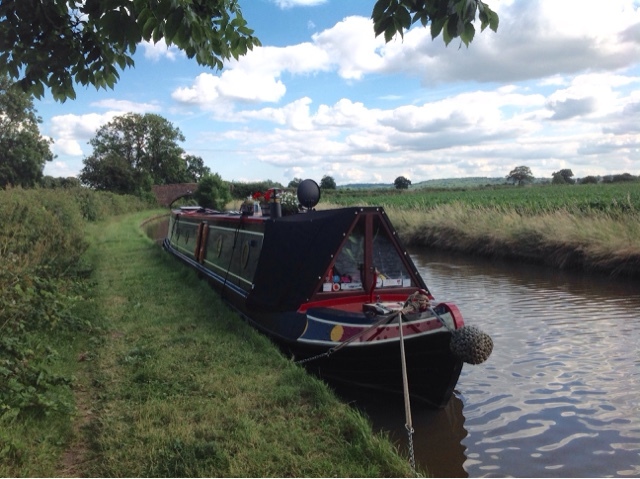 Tomorrow we will depart here heading for Hawkesbury Junction and the Coventry Canal. We departed our mooring after breakfast and turned right at Norton Junction onto the Grand Union. As we approached Braunston tunnel we were closing in on a boat ahead. 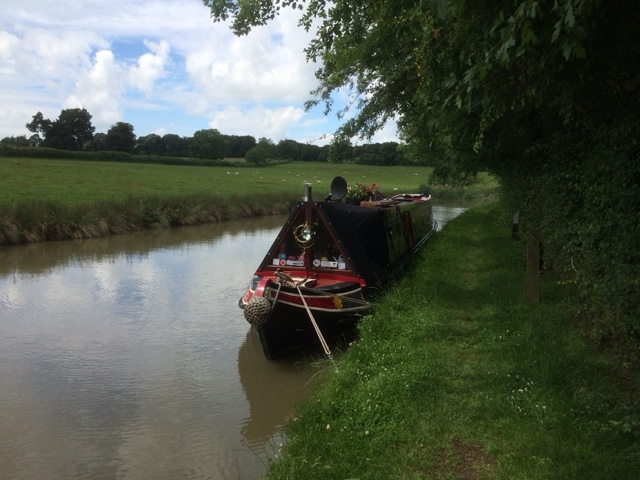 It was a Wyvern Shipping hire boat from their base in Leighton Buzzard, and the hirers were on a two week cruise to Banbury and back. With our locking partners short work was made of the six double locks, and two hours after setting off, we were mooring by the 'Gongoozerlers Rest' to fill up with water. We made a decision to stop in Braunston for lunch, opting to use the facilities of the Boathouse P.H. as a reward for our hard work. After lunch we set off again, aiming for our intended mooring spot about half a mile outside Braunston. We passed the junction at Braunston Turn, this time bearing right onto the North Oxford Canal heading towards Rugby. We will stay here a day or two as it is nice rural spot, and subject to the weather we will get to work on polishing our brass. Our seclusion at this spot did not last long as we were soon joined by not one, but four more boats over the course of the next few hours. Our mooring by bridge 9 on the Leicester Line was visually pleasant, but did suffer a little from the low drone of the nearby M1 motorway. We were only about a ten minute cruise to the top of Watford Locks. Even before we got up we heard three boats pass us heading for the flight, so we did not rush, enjoying breakfast before setting off. On arrival at the locks the three boats were still there, waiting, so we were number four in the queue. Checking in with the volunteer lock keeper, he informed us he was letting six boats up before we could descend. We were in for a wait, and our place in the queue had us directly beneath the damp and gloomy motorway bridge. Our total time down the flight of seven locks, including the waiting period, was about two hours. We continued on, passing Watford Gap services and arrived at our usual spot about 100 yards prior to the junction with the Grand Union Canal. It was quite busy, but we found a spot to shoehorn ourselves into, then it was off to the New Inn for a Sunday roast.